I'm finally back in the office after 2.5 weeks on the road: first for IBM ConnectED 2015, then on to Austin to meet with the IBM Design team and work on IBM Connections Next. In between all that, however, my Mac decided to have a meltdown. Luckily, it was the Tuesday after the keynote at IBM ConnectED. My big worry, though, was, since my Mac died on January 27th and I knew my last Time Machine backup was on January 21st... how much was I going to lose ? I frantically started to search the forums and nothing that they suggested helped. Then all of a sudden... "did I just lose all my IBM ConnectED 2015 demos, presentations, content, etc???" I open the IBM Connections mobile app on my iPad with slim hopes. To my surprise, however, all my content was there just fine because all my work was happening in the IBM Connection sync folder. Success ! I ended taking it to the Apple Store last week while in Austin. The Apple Genius ended up wiping my disk clean and resetting and said it was an issue with File Vault and Yosemite. 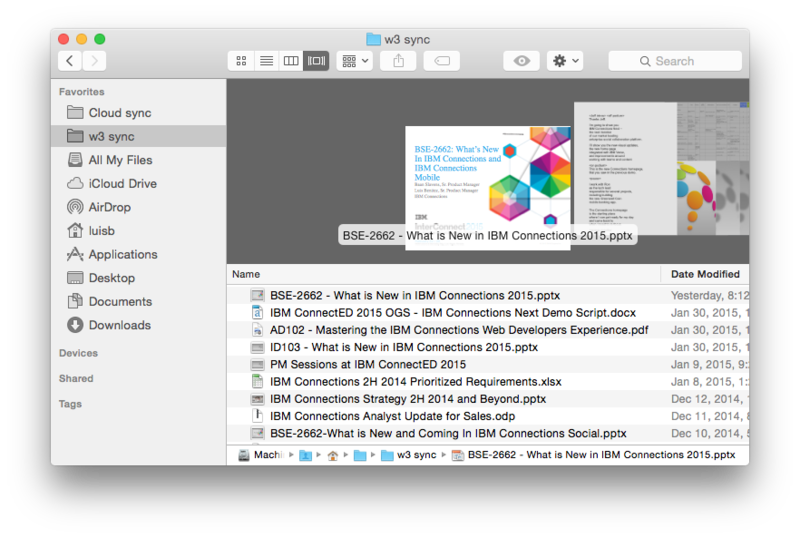 Once back home, I restored from Time Machine and did notice I lost 2 files that for some reason I hadn't stored in my IBM Connections sync folder. But that was a lesson learned... from now on, all my work is going to the IBM Connections sync folder, especially given I have 1 TB of space to store files in the cloud.